Posted on September 20, 2011. Having solid credit is a great financial asset: A good score makes it more possible to buy a home and to negotiate a favorable mortgage agreement. It can also help you obtain a favorable car loan. Or it means that you’ll be viewed as a more acceptable tenant, or even a more desirable employee. And of course, it affects your ability to be approved for any new credit cards. Many credit card holders mistakenly believe that once they pay off a delinquent debt, the missed payment will immediately be removed from their credit report. The truth is: Only time will clear a damaging mark. It takes up to seven years for a missed payment to disappear from your report, and up to 10 years for a Chapter 7 bankruptcy to be erased. If you fail to pay off a debt and the account goes into collections, the clock will keep ticking, says Experian’s director of public education, Rod Griffin. “Federal law requires that collection agencies carry over the original delinquency date from the original account and report that to a credit-reporting company. Another common myth is that when you marry – your credit reports merge and then split if you should divorce. The truth is that marriage partners retain their own credit report. 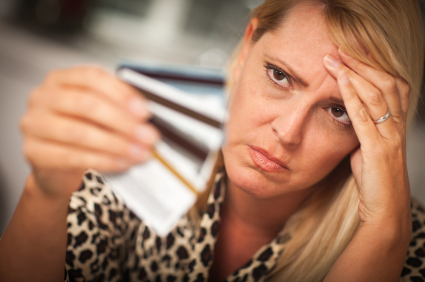 Even if you marry someone with a spotty credit history, it won’t show up on your report. However, if you and your spouse sign up for a joint loan, you become equally responsible and delinquencies show up on both credit score histories. But being married doesn’t make you financially liable for a spouse’s loans. However there are two exceptions. Being married does make you financially liable if you have co-signed or live in a community property state. Many mistakenly believe that if they always pay their bills on time, they needn’t check their credit report. The truth is, it’s prudent to check it from time to time to be certain it reflects current information, with no errors. That way you can feel secure you’ll be approved should you need to apply for an unexpected loan. The difference between ‘soft’ and ‘hard’ credit history pulls is another common area of confusion. The fact is – a ‘soft’ inquiry, like when a vendor is determining whether you’ll be granted a special deal, or a potential employer or landlord asks to see your report – won’t affect your credit score. However, ‘hard’ inquiries, which occur when you apply for a new loan or credit may temporarily dent your credit score.